Top Gun is one of the all-time classics in Hollywood movies. The men have made every attempt to get their hands on the aviator jackets. 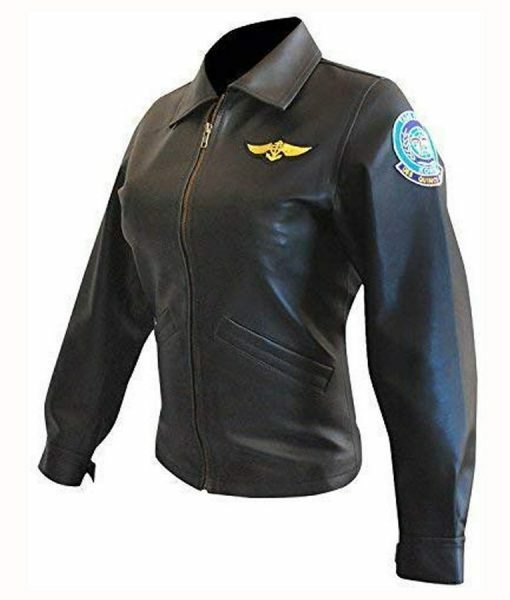 However, with their succession, it is time for our clothing store to give the women that excellent opportunity with the Top Gun Pilot Charlie Leather Jacket. The Kelly McGillis Top Gun Pilot Charley Black Leather Jacket is the ideal wear for women who are fond of jackets like this. It is made by using real leather and viscose lining – a lining that will keep the level of comfort the same for hours. There are two pockets on the outside, belted cuffs, classic collar, and badges stitched on the chest and arm, matching the one in the film.